Looking for Albury Wodonga website hosting? All our clients websites are hosted in Australia Our servers are located in Melbourne Australia where we, sure you could get cheaper hosting if you had your site hosted overseas but we use hosting services that are Australian owned and operated and the data center guarantees over 99% up time. Another thing to note is that where you have your website hosted is a factor to take into consideration. If your primary audience is based in Australia then your website should also be hosted in Australia as this will be looked on favorably by search engines as part of your overall SEO profile. Hosting is not only available to clients for whom we build websites but is is also available to clients/ businesses that what hosting but what to build their own website or have someone else build it for them on a platform that is ready to go. Our hosting packages come with full access to Cpanel and WHM and clients are free to access these area if they need to. Access to the hosting Cpanel gives clients access to many tools related to their domain hosting such as website statistics, DNS management, Email Management (if hosted with their website), ability to create backups, manage databases, manage spam filters, view disk space and bandwidth usage, run a virus scanner on their account to name a few. Clients also have access to FTP access for their account if they need it. Some of the tools that are available may only be used at the initial time of set up but if you ever need access its good to know that it is available to you. Below is a idea of what is offered with our Cpanel hosting. Do your research before jumping in. Q. Is the hosting done in Australia? A. Australian hosted websites that have a primary audience in Australia are faster than those hosted overseas and perform better in search engines. Q. What happens if in the future I want to move my website/hosting to another company? -some companies lock down the sites and charge a fee to give you a copy of the site to take to the new host. Q. Who keeps the website software up to date (the core software and any plugins that are installed)? A. Unless the developer uses proprietary software to develop the website (in which case they should have informed you of this before starting) all ownership of the website should be that of the owner/client once they have paid for it. Note: If proprietary software is used to develop a website it may only be licensed to work on their servers so if you want to move your website to another hosting provider this ma not be possible and you may have to get the site rebuilt. WordPress is the most popular platform and represents over 27% of all websites online. It can be quite easily moved from one hosting provider to another – some technical knowledge is required but your new host should be able to assist you. All our clients have the ability to have access to Cpanel interface for their hosting account and this gives clients access to many tools that are part of the suite. One of the Cpanel administrative tools you will have access to is the Installatron application. If you are someone that likes to dabble in working on your own site, Installatron is a application that is integrated into Cpanel that will allow you to easily install software (from over 150 free scripts/software.) in a matter of minutes, undertake backups of your website and complete updates as they are released. Remote Backup – Backups of installed applications can be created, and whenever necessary, backups can be restored to return the application to the state it was in when the backup was created, whether or not the original application is still installed. Installed applications can be backed up to FTP, FTPS, SFTP/SSH, WebDAV, and Dropbox instead of or in addition to the local server. Automatic Backup – An automatic backup system for installed applications that’s flexible, reliable, completely managed, and easy to use. Enabled at install time or later by editing an installed application, Automatic Backup will automatically maintain installed application backups based on the selected schedule. Backups are created, rotated and deleted between midnight and 6AM server time to maintain the selected schedule, and a failed backup will never rotate a working backup. WordPress Integration – WordPress is one of the most popular applications available today. 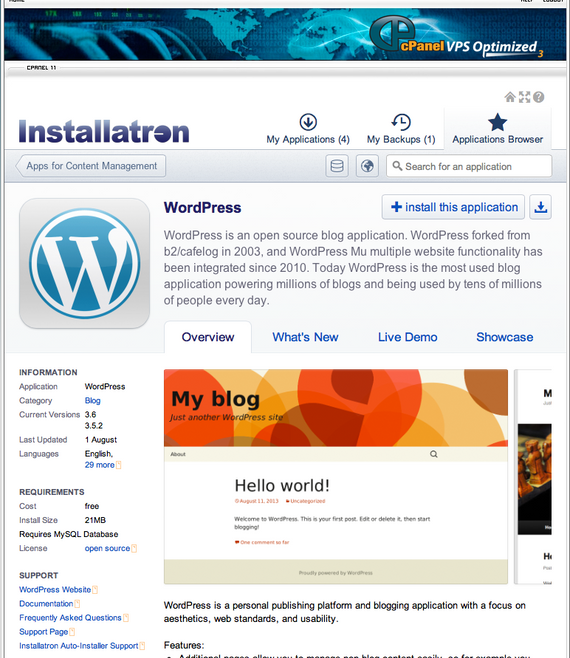 WordPress has a particular focus throughout Installatron Plugin. If you are a larger organisation and you want to use an external provider for you mail such as Microsoft Exchange Online (365) or Google G Suite we can assist you with their setup and configuration. There are various benefits to having your website hosting and email services separate and with the increased reliance on people having multiple devices that they want to keep in sync with each other specialist email hosting providers may be able to offer you services that may be of benefit to you. Note: these services come with an additional cost (that you pay them directly). If this is an option that you are looking for we can talk you through your options. If we have built your website using WordPress and host your website then we will also manage the WordPress and associated plugin updates for you. What that means is that when security or software updates released we will undertake performing backups and updates and ensuring that any updates that are undertaken don’t break the website. See our website maintenance section for more information on this. Carmelo from Stones Throw IT currently hosts five community and club websites for me. I started using Stones Throw back in 2012 and have always been extremely satisfied with the service I have received. Carmelo is very approachable, helpful and always makes time to listen to your concerns. I can ring him up and ask him about solutions to problems, and for us ordinary folk who dabble in this IT stuff, that is reassuring. As far as I am concerned, support when you want it is the most important requirement for an hosting provider and Carmelo is always willing to assist. As he says on his website, “We always give back to our community, and as a result, we develop and host non profit organisations’ web sites every year as part of our community contribution at a vastly reduced cost’. This is another reason I went with Stones Throw IT, as I design and develop community and club websites where cost is a major consideration. I highly recommend Stones Throw IT.